Celebrity chef Jamie Oliver has extended his contract with supermarket giant Sainsbury's for an undisclosed sum. Oliver, famed for his "pukka" catchphrase and cheeky cockney persona, has been the TV face of Sainsbury's for the past three years. He is set to appear in a fresh series of adverts over the next 12 months. 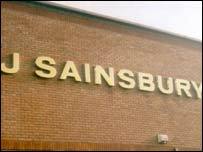 He will also work on product launches and continue to develop recipe cards for customers, Sainsbury's said. The retailer claims Oliver has had a direct impact on its sales, helping it to maintain its slender grip on second spot in the UK supermarket stakes, behind Tesco. When Oliver recommended spreading truffle butter under the skin of Christmas turkeys last year, the company said, more than 50,000 jars of the product were sold. Some advertising industry sources have even claimed Oliver's association with Sainsbury's has brought the company an extra £1bn of sales - or more than £200m in gross profit. But many retail analysts are sceptical about Oliver's impact on Sainsbury's flagging performance. Earlier this year, the company unveiled annual profits of £667m. But its disappointing 2.3% increase in sales, in stores open more than a year, left investors shaking their heads. By comparison, Tesco's annual profits were up 13% to £1.3bn, with a 4.1% in sales from existing stores. Some analysts say Sainsbury's has already lost its second place to US-backed Asda. Richard Ratner, retail analyst at Seymour Pierce, said no amount of Jamie Oliver's mockney charm could disguise the underlying malaise. "It is possible to see the effect of Jamie Oliver's endorsements on individual lines, but the overall effect is impossible to calculate. "It certainly hasn't had a major effect. Their like-for-like sales (discounting the effect of new store openings) are not where they would like them to be." TV chefs are highly prized by marketers for their ability to shift individual products. But the impact of their endorsement is much harder to quantify across an entire retail chain. 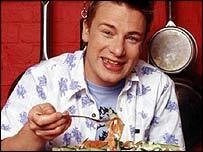 "I suppose it could be argued that if it wasn't for Jamie Oliver, they would be doing even worse. "But there isn't a Jamie Oliver line as such, so it is difficult to tell. "Perhaps they should stop the Jamie Oliver ads and see what effect that has on sales," Mr Ratner told BBC News Online. Dominic Allport, at Mintel, said Sainsbury's were "still struggling quite badly." One major problem, he said, was that they are losing ground in non-food retailing. High profit margin items such as clothes and electrical goods are a major growth area for supermarkets. But Sainsbury's were struggling to keep up with Tesco, and Oliver's ads, which have so far concentrated on food, are unlikely to be much help. He said they also had few town centre stores, which would allow them to sell "value-added products to more affluent customers." They also needed to move away from their strongholds in the south, open more stores in the north, where they have about 7% of the market. But "trying to keep pace with the juggernaut that is Tesco" was a tough job for all UK retailers, he added. There were signs that Sainsbury's is starting to win the battle. But the turnaround has not been as quick as that achieved by another iconic British retailer, Marks and Spencer, which has concentrated on new product lines and store revamps. Sainsbury's was trying out innovative ideas - such as joint ventures with the likes of Boots and Early Learning Centre - but the results were so far inconclusive, he added. Jamie Oliver has undoubtedly generated a lot of publicity for Sainsbury, Mr Allport argued. His recent Channel 4 series, in which he gave a group of underprivileged teenagers a chance to train as chefs had been particularly successful, helping to fend off growing cynicism about his "pukka" lifestyle. But there was still a danger of over-exposure, Mr Allport argued. "They have got to tread carefully with Jamie Oliver. There is a fatigue effect if he is seen too much. "Another year is perhaps sufficient."